Capture a vintage look with recycled materials - it's easier than you think. 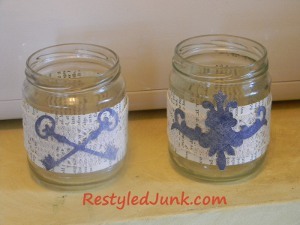 To make an Old World Glass Jar Candle Holder, save a clean, empty salsa jar and old book pages. Use them to create a versatile home decor design bursting with old school charm. 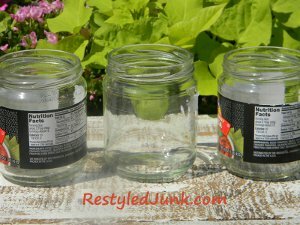 Clean the label off the jar. I don't know why, but all of the salsa jars I have recycled had labels that didn't want to budge. After a lot of soaking in hot soap water the most I could rub and scratch off was the paper. I was still left with a very sticky glue. I tried many removal options, but the only one that worked completely was Goof Off. It's a bit smelly, so you will want to work in a well ventilated area. Outside is best. Dispose of your cleaning rags (paper towels) outside as the odor will permeate the inside of your home. Tear a book page out of an old book. 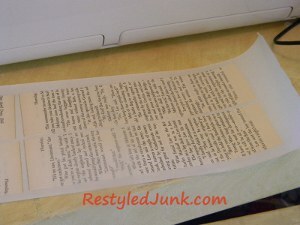 Cut and trim enough book page strips to measure 2 1/8 inches wide by 12 inches long. Send the strips through your Xyron Sticker Machine to attach adhesive to the back. 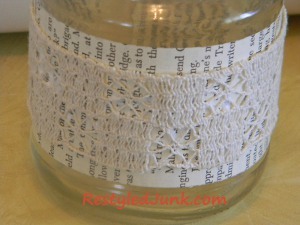 Apply the book page strips around the center of the jar, overlapping the ends as needed. Cut 1 1/2-inch-wide off white lace 11 1/2-inch long. Apply craft glue to the back of the lace. 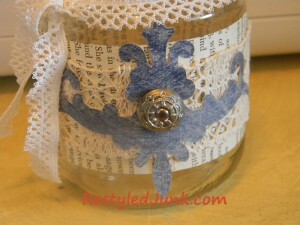 Center the lace on the book page strip around the jar. The back of the candle holder is where the seams of the lace come together. Purchase or cut your own 2 1/2 to 3 1/2-inch paper die-cut using paper of your choice. Send the die-cut through your Xyron Sticker Machine to attach adhesive to the back. Apply the die-cut to the center-front of the candle holder. Apply craft glue to the back of a button or charm. Lay the jar on its side and place the button in the center of the die-cut. 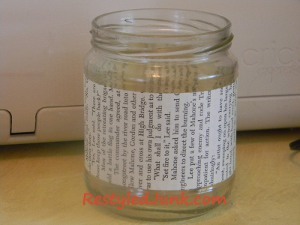 Allow the glue to dry before setting the jar right side up again. Cut 1/2-inch-wide off white lace 18 inches long. 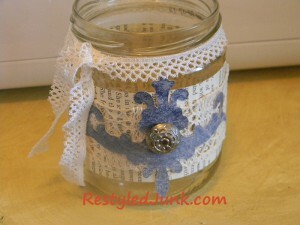 Wrap the lace around the rim of the jar and tie in a knot off-center on the front of the candle holder. Trim the ends as desired. Pop in a tea light candle and you are done! This craft is adorable. I love the lacy detail against the old paper....Sooo vintage. I'm wondering if I could use a mason jar to make this. I love recycled crafts. 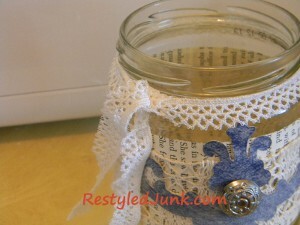 The little Old World Glass Jar is absolutely adorable! They would make great gifts for any occasion. I'm a beginning crafter, so please bear with me. If I don't have a Xyron sticker machine, can I still make this craft? I don't have one either, but I thought if you fold the paper in the middle, you could cut the design you wanted, unfold it, and both sides would match.